Dragon Quest XI has a lot of what makes a JRPG a great one. It has a big story journey with captivating moments of accomplishment and struggle, a refined battle system that takes the best part of classic JRPG ones, great character designs in both art style and personality, and a meaty playtime that can easily go beyond 100 hours if allowed to. All of these things are placed in an unfolding world full of plenty of things to find and discover in its journey that create a big difference between everything you can do at the start and end it, and with noticeable story arcs reflected in the world mixed with the humour and charm the series is known for, it really did feel like I’d been on an epic quest by the end of it. As my first step into the Dragon Quest series, I’m pleased to say I was charmed by its story and characters as I had hoped to be and I was also pleasantly surprised how its unfolding mechanics and story made each hour in its world feel meaningful and fun with how well it showed off its polished traditional JRPG mechanics in a modern JRPG world. 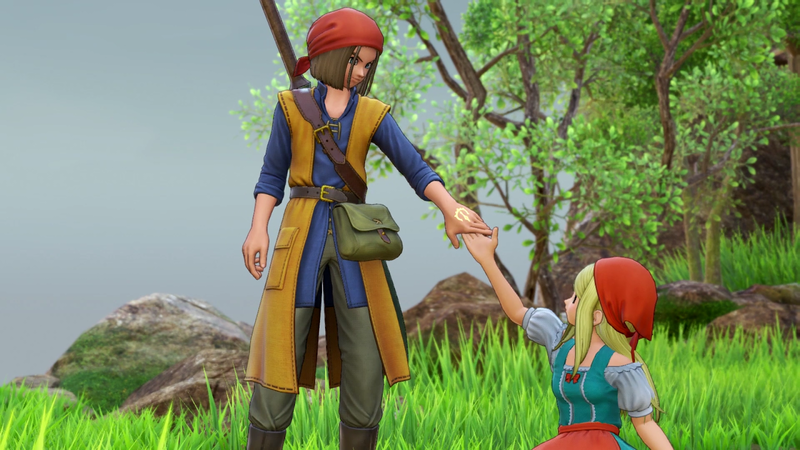 Dragon Quest XI follows the story of an adopted boy raised in Cobblestone who possesses a unique mark on his hand. This mark signifies that is is a reincarnation of a hero of past, known as the legendary Luminary said to have saved the world previously, which he finds out on the day he comes of age after his powers surface when he protects his childhood friend. With that knowledge and a special necklace he’s given that day, he sets out to the city of Heliodor to tell the king to find out more about his destiny, but is treated as if he is evil, quickly branded as The Dark One and sent to the dungeons instead. With a rough start, he carries on to find his destiny and his journey of making allies, discovering his powers and proving himself as the saviour of the world begins from there, with many struggles that lead to great triumphs and losses as well on the way keeping the story engaging throughout. This is a very basic summary of the start of the story and it’s interesting summing it up like this as the story grows well beyond the protagonists humble beginnings. With my main story playthrough spanning around 80 hours, these hours were full of plenty of development in characters and world, clear story arcs and changes that make that beginning feel far away by the end of it. The pacing of the story is a little on the slow side, but I didn’t mind as I found the pacing to feeling almost like episodes of an anime in a way, complete with a mid-story arc. There were moments of the story that took the time to look into the game’s very different characters, like the mage sisters from Arboria the kind Serena and witty Veronica or the colourful circus performer Sylvando, with each having their own episode-like moments to shine in the story, on top of the clear arc halfway through the story that serves as clear change in the world that ripples into the tone of the story and gameplay going forward. 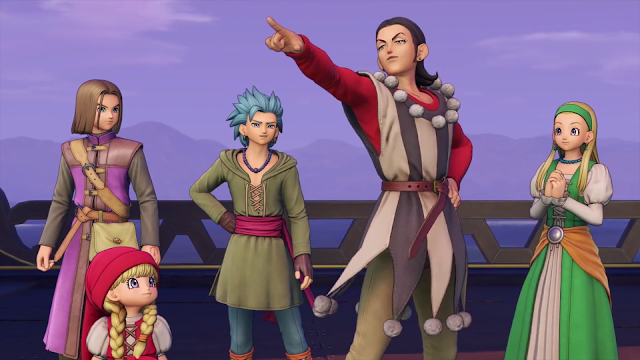 This structure of having moments big and small that always added meaning to the plot made Dragon Quest XI’s story a pleasure to experience and I can say that despite having a very typical story premise of a battle of between light and dark, there wasn’t a moment that felt typical or boring in its exciting story journey. 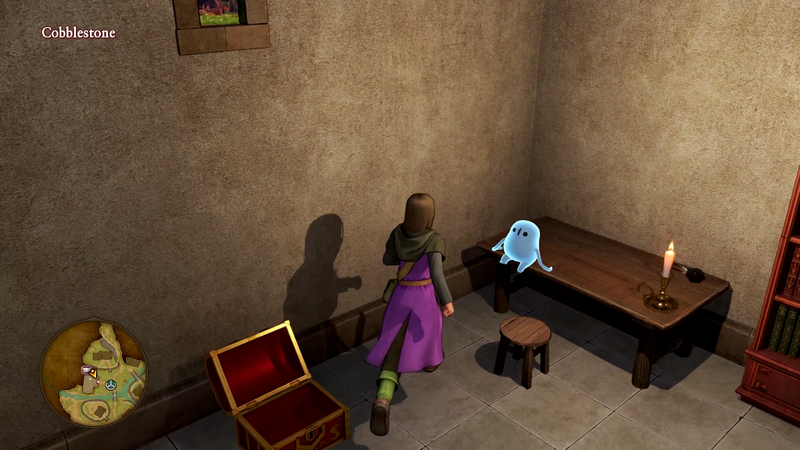 The Luminary’s story is set in Dragon Quest XI’s world of Erdrea, a world of full of many different regions, monsters and ways to traverse it. The game quickly introduces its turn-based battle system, which will no doubt be easy to pick up for those with experience with the Dragon Quest series or turn-based JRPGs in general. After finding enemies on the field, you’re given the options to use physical or magic attacks, along with your typical JRPG stat buffs and ailments, which while it doesn’t bring anything too different to the system, it does deliver it in a smooth, easy to use way with its simple UI and adds a little variety thanks to the challenge given by some of its enemies and boss battles. There is one unique aspect in battles in the form of its Pep System that sees characters that have achieved certain conditions such as taking a lot of damage enter a charged up state that can allow them to team up with the Luminary and other allies to unleash some cool, stylized attacks that break up the regular turn-based system nicely and were fun to watch as I gained more characters. Ultimately, Dragon Quest XI doesn’t reinvent the wheel when it comes to combat, but what it does it does well and with cool-looking animations to add a bit of style, I found the combat enjoyable since I’m generally a fan of turn-based games. Although its battles are typical of most turn-based JRPGs, I liked how it gave you a reason to fight certain foes since some can help traverse its big, open fields with certain areas on accessible by using certain steeds. The game gives you a horse fairly early on in the game, but this is just the start of what the protagonist can ride - at different points of the game, you can ride things like jumping robots, skeleton beasts and even flying dragons to help get to different spots in its detailed areas. While you can’t ride all of its foes, I was still finding these late into the second part of the story and was always excited to find a new one. 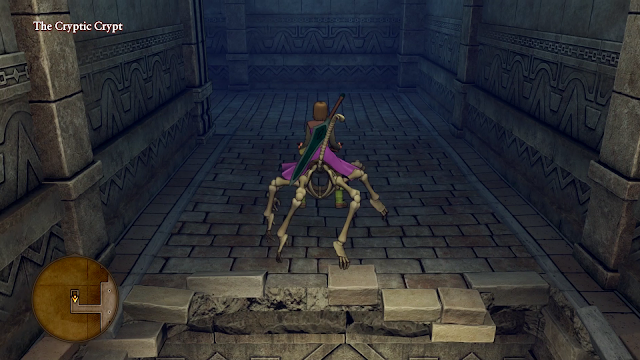 The designs of Dragon Quest XI’s monsters were already cool, but being able to beat them then use them to explore made fighting them feeling much more rewarding and was a great way to add variety into exploring its world. These many ways to explore are however only the cherry on top of an already detail-filled world, both in and out of its many cities with a clear amount of thought put into many finer details. There are materials to collect, books to read on shelves and doors locked with mysterious keys and each house visited in its world usually had one or two things in it to make me glad I took a look inside. Whether in quests or hiding in plain sight, there are lots of small details that make Dragon Quest XI’s world feel full, but beyond that there were multiple times in the story I thought I’d finally found all the places on the map just to be delighted to get more in the next part of the story. I had some expectation of towns full of charming NPCs and lots of small things to find from what I already knew about the series, but Dragon Quest XI definitely did exceed my expectations of that and the amount of little things I kept finding in my first playthrough makes me absolutely sure there are more things waiting to be found when I come back to it. Beyond many things to explore and find, there are also mini-games and other gameplay system to fill the world up even more. From casinos to horse-racing, there’s a good amount of mini-games for those looking for a break from the JRPG aspects of its world for a minute or hours depending on how deep or addicted you get to them. As a more useful one, I found myself pretty into its satisfying equipment forging mechanic that felt like a mini-game, with the use of different forging skills gained based on your characters level and story progress affecting how successful your created or upgraded weapon is and playing with the temperature and hit strength was oddly satisfying to try and get right as I tried to make the equipment recipes I’d found on bookshelves in my journey. Whether you try its mini-games, quests with amusing NPCs or just explore the detailed world, there’s always something to do in and out of the story in Dragon Quest XI and even though I only scratched the surface of these in my 80 hours with it, I can see at least another 50 hours with the game if I decided to platinum it or spend more time going deeper into it. Part of what makes Dragon Quest XI really feel like its own world is the wonderful art of Akira Toriyama brought to life in 3D form. I’d seen Toriyama’s style in anime like Dragon Ball Z and love how it looks in a 3D world, with it really creating a consistent visual style that I couldn’t help admire with its great the character and monster designs. While the visuals serve as a great upgrade to Dragon Quest’s past visuals, I had a small concern before I played Dragon Quest XI about the music for this entry, considering it doesn’t have an orchestrated soundtrack which is generally standard in JRPGs these days. During my first few hours with Dragon Quest XI, the midi soundtrack honestly did stick out a little for the wrong reasons, with the midi making the corny moments of its tracks really obvious at times. But if it’s something you’re also worried about, I do want to stress that I did get used to a few hours later and it didn’t diminish the great parts of the game once I got used the seeing and hearing the audio and visuals together and it kind of gave its own audio and visual quality that is very distinct so it definitely grew on me by the end of it. While I would prefer an orchestrated soundtrack in the next entry because it did make me like it enough to play the next one, Dragon Quest XI is a good enough game for me to forget about this for the most part and should by no means be a reason to pass on everything else done so well in this great JRPG experience. 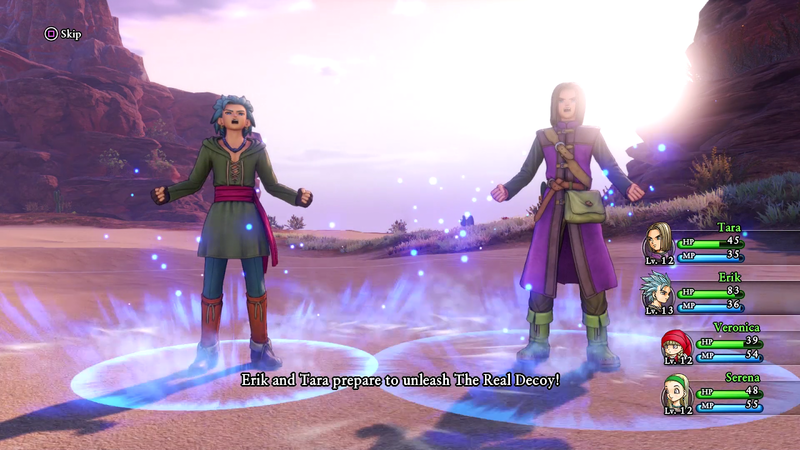 With a world full of plenty of thought from how to explore its world to the way its story unfolds and ripples throughout, Dragon Quest XI is a detailed and fun world to explore whether its your first time or not. I loved the way its world grew mechanically and visually as its story progressed and that each of its story moments always added something to its growing world, whether it be with new detailed areas to explore or giving me new things to use in my journey. While I’ll be moving onto other experiences after it, I love that I’m walking away from Dragon Quest XI feeling like I really went through a journey seeing everything in it grow and change, with all the turn-based mechanics and world-building aspects making it feel like a pleasure to explore and leaving plenty left to discover. If you’re looking for a classic-inspired JRPG with the smoothness of a new one, Dragon Quest XI is one I definitely recommend and have a feeling will be up there when looking back on the JRPGs of this year. From dominant hands to jumping robots, Dragon Quest XI's detail world is one I'm sure I'll be back to find even more about sometime! Did you pick up Dragon Quest XI? If you did, what did you think of it? I just found your channel and, as a result, your blog. And I'm loving your content so far. My friend is a big Dragon Quest-hater and I often found myself not being able to explain it's greatness. Your review however takes the words right out of my mouth as to why it is such a great game, so I want to thank you for that. Thank you and keep doing such a great job!